My Checkbook 2.2.3 is personal finance software developed by Surprise Software. My Checkbook makes managing your personal finances a snap. With simple daily entry and automatic balance features, you'll never bounce a check again! Easily manage your automatic transactions with the schedule feature or use it to remind you of bills you must pay on time. You don't have to read manuals or become a computer expert just to manage your checkbook when you use My Checkbook. Surprise Software's unique design gets you going quickly. My Checkbook 2.2.3 supports different languages (including English). It works with Windows 98/XP/Vista. Latest My Checkbook 2.2.3 does not contain any spyware and/or advertise modules, allowing installing it with no worries concerning valuable information loss. We has completely tested personal finance software My Checkbook 2.2.3 many times, written and published the interesting article and uploaded installation file (1080K) to our fast server. Downloading My Checkbook 2.2.3 will take minute if you use fast ADSL connection. Enter and balance your financial transactions. 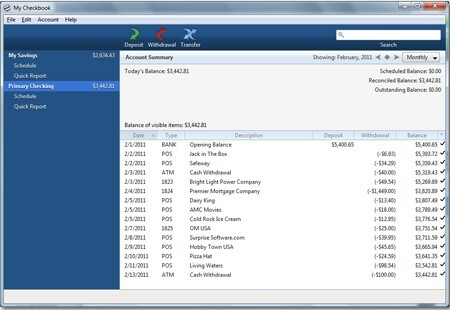 Titanium Checkbook is a program for tracking your current and future finances. Checkbook Ease 2.1 Freeware checkbook/budget,beautiful window with 20 colors. My Checkbook Lite is based on the program My Checkbook, but doesn't have any features but the bare minimum basics.